Last Sunday, I saw Asha Bhosle perform. I said a little bit about Asha here. I could not really think of an analogue to Asha Bhosle in western popular culture. 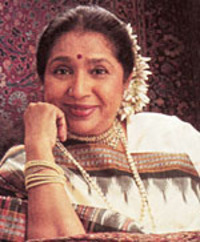 She has been one of the best loved singers in Hindi film for some sixty years. Considering the reach of Bollywood's audience, her name is probably known to a quarter of the world's population. She is truly a living legend. And, for a short time on Sunday evening, I and a few hundred others got to breathe the same air as she. It's difficult to describe what the experience was like. Asha jii herself, seventy-something years old, was at once substantial and frail. She moved at a deliberate pace, and spoke deliberately as well. She told long stories that seemed rambling, almost stream-of-consciousness, until she delivered the perfectly timed punchline that let us knew she knew just where she was leading us. And we, the audience, sat on the edges of our seats, delighted with every word, wishing she would never stop talking and at the same time wishing she would stop talking and start singing. When Asha jii finally did sing, her spirit and strength reverberated and she was energized. Her performance wasn't perfect - it took her a song or two to warm up enough to really hit the high notes - but at moments her voice was as clear, as sweet, as flirtatious as ever. So while she wavered a bit off key in her opening number - "Chura liya hai tum ne," one of my favorite songs - she was smooth as silk in "Dum maro dum," and nailed the agressive descending chromatic scales in the rocking "Piya tu ab to aaja." "Dum maro dum" is a special song to me and I was particularly delighted that Asha jii performed it. (I wasn't alone; it's clearly a crowd favorite.) That song was the first track on the first collection of Bollywood music I ever bought, and I was hooked from the moment I heard it, hooked on Bollywood and hooked on Asha Bhosle. I've had new favorite songs since, but "Dum maro dum" remains close to my heart - even after I learned that it's really all about smoking pot. Asha jii performed with the Kronos Quartet, whose arrangements are a little too self-consciously playful, but they knew the night was all about Asha jii and got out of her way when necessary. Two other brilliant musicians also joined them - China's Wu Man, an exceptional pipa player; and Zakir Hussain, India's most celebrated tabla player. They were both tremendous and added enough eastern masala to the Kronos's rather stiff and bland string-quartet sound. In the end, though, the night belonged to Asha, and seeing her perform live was the opportunity of a lifetime. Sounds like an awesome experience. I would love to see perform live.